Who doesn't love denim?! I mean I feel like everyone has a favorite pair of jeans in their closet that they wear over and over and over again. No matter how many pairs of jeans I buy, I always find myself gravitating toward my favorite pairs and I have to make myself diversify. Fall is the perfect time to get those staple jeans in your closet because they will carry on over to winter as well! For the purpose of this post, I've rounded up some of my favorite jeans this season. I love a nice distressed pair of jeans, but you can never go wrong with a solid skinny! Also, I'm really into the new frayed bottom this season like #7 and #8! They add a new pizazz to the jean look. One of each, please and thanks? I have the hardest time finding the perfect pants, but these all look like winners! I am very addicted to the distressed look, so #4 and #7 are my faves! So many great picks! Can never have too much denim! Can I have all of them, please!!???! So amazing! I can't get enough of all the ripped denim! I love those loose distressed ones, they look so comfy but still so stylish! 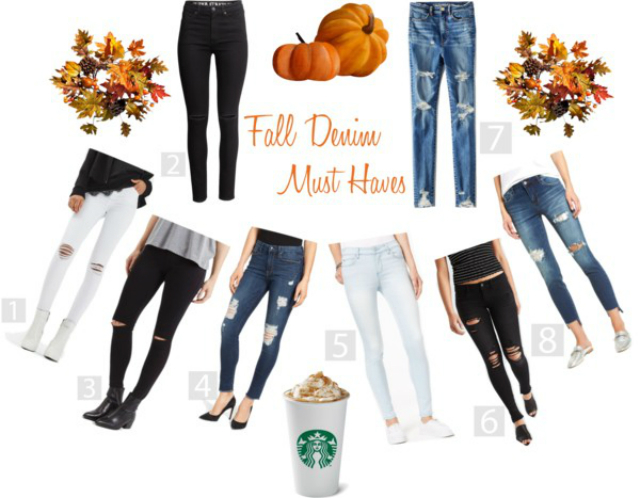 I'm a tried and true denim girl- love your picks! Love all your picks! So cool! I'm loving fringe denim and high/low denim right now! But you can't go wrong with classic skinnies! These are cute picks! I love #8!